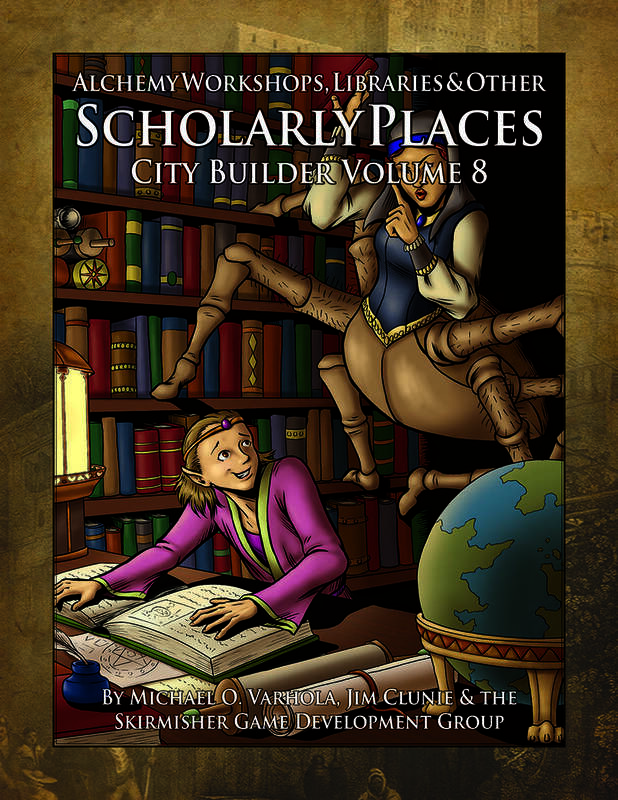 City Builder Volume 8: Scholarly Places is the eight offering in a series of 11 complementary books designed to help guide Game Masters through the process of creating exciting and compelling urban areas and places within them for their campaigns. It is a universal resource that is not specific to any particular game system and is intended to be compatible with the needs of almost any ancient, Dark Ages, Middle Ages, Renaissance, or fantasy milieu. This download includes low-resolution screen-friendly and high-resolution printer-friendly versions of its cover surfaces, low- and high-resolution versions of its interior pages, and a text-only version of its interior pages. Its layout and design has also been slightly modified from that of early volumes in the series in response to comments from readers and in order to make it even more user-friendly. This title was added to our catalog on September 01, 2008.